While browsing around and dropping some Entrecards, I came to a site that caught my attention. Another gadget/device/electronics that triggers and intrigues me of the specification /features it can offer me. Immediately, I browse in Google and learned more from the features it has. 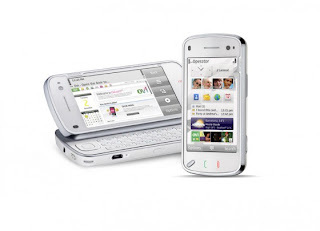 I’m talking about the new released or newly launched Nokia N97. I find it pretty much interesting but to check the prices online? whoowww dude!!! Too expensive and I can’t afford to have it, since I still got my N70 and used it as my roaming phone, I could not afford to buy one that soon. I am eyeing of this N97 and optimistically by the time, I visit the Philippines again, and the cost of this device will diminished, that way I could afford to trade or buy that one. oi, that's nice. balitai niya ko if kapalit na ka. hehe.